Can't find the calendar? Scroll down! Time: 5 PM to 7 PM - Thursday April 18 and Thursday April 25. Join women pickleball players and let’s have a couple of nights of play time without the guys. We’ve reserved the Green Lake Pickleball Court for a fun evening of pickleball - bring your paddle, your best game, and sense of fun. Note: courts are reserved for the women’s play group, donations for reservation fees may be solicited, and rain cancels. The Seattle Metro Pickleball Association announced the Seattle Metro Pickleball Classic tournament will take place July 26th to 28th in Shoreline. See our Tournaments page for more information. Time for pickleball tells you where and when regular drop-in pickleball games are happening. It's pretty good at what it does, but there is a lot it doesn't do. Playtime Scheduler makes it easy to organize one-off games. At the end of March, over 100 players from the Greater Seattle area had already joined and a few play sessions had already been successfully organized. The more people join, the easier it will be to organize games. 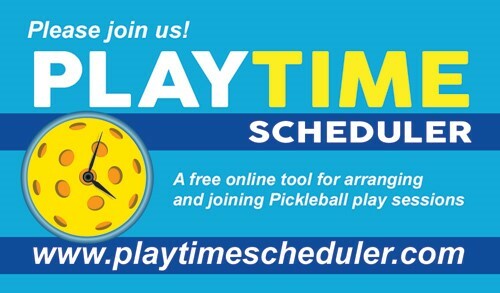 Go to the Playtime Scheduler web site. Select Greater Seattle Area, WA as your region. Fill in your information. including your zip code and skill level. Tell the system when you are available to play pickleball and how far from home you are willing to travel. That's it. You are now ready to join an existing session or create your own session and invite people to join. When someone creates a new session that fits your availability, your travel zone, and your skill level, you will receive an email. If you have any question, please email infotimeforpickleball.com. Theresa Haynie is organizing two women's pickleball nights at the Bob Hassan Pickleball Courts at Green Lake (outdoors) on Thursday April 18 and 25 from 5 to 7pm. Mike Porter is organizing play on the Bob Hassan Pickleball Courts at Green Lake (outdoors) every Tuesday from 5pm to dusk, until Fall. Many thanks to all the players and staff members who let us know about schedule changes. Please email schedule change information to infotimeforpickleball.com. Since most facilities state that "Programs, hours, and fees are subject to change without notice", the information included here cannot be guaranteed to be accurate. Call play locations within 48 hours of play to verify daily schedule. Make sure the location is open when you call. Pray that the person answering the phone is aware of the latest schedule changes and gives you accurate information. Click on a time below to see the original document that listed that specific time. On Mondays, pickleball needs to be done by 11:30 sharp to allow the staff to setup for the next activity. Subject to changes during school holidays. Call to confirm. Tip: If you are looking for beginner or intermediate players, come early. If you are looking for more advanced players, come later. 9:30 a.m.* - 11:00 a.m.
*The official start time is 10 a.m., but the community center staff is often kind enough to let play start at 9:30 instead. Limited availability during school holidays. Call to confirm. If you attend this (competitive) session, you will not be allowed to attend the afternoon (recreational) session. Don't step in the gym before noon or you might be deemed to have attended the "competitive" morning session and therefore be ineligible to attend the afternoon "recreational" session. Hosted by Mike Porter. Thank him! Not a true pickleball facility. Hours could change depending on Bellevue School District closures. Contact the North Bellevue Community Center for updates. Courts are reserved for the women’s play group. Donations for reservation fees may be solicited. Hosted by Theresa Haynie. Thank her! NOTE: the Community Center opens at 11:00, so don't come early. Uncrowded venue recommended for intermediate and advanced players. Check the Puget Sound Pickleball Meetup group to confirm play times. April 20: the indoor and outdoor courts are reserved by the Seattle Parks and Recreation Department until noon on April 20 for a spring egg hunt . Outdoor pickleball play will start around noon and finish "whenever" on that day. Check Facebook for confirmation on bad weather days. Please bring a net if you have one. Hosted by SMPA directors Sean Oldridge and Frank Chiappone. Thank them! Please register on Playtime Scheduler if you know you will attend. *Unless the gym has been rented for a special event. Call to confirm before you go. This is "open gym" time, so the gym is open to everyone. Typically, pickleball players get access to 1 to 3 courts depending on the number of pickleball vs other players. All pickleball equipment should be taken down by 11:55 am so that basketball can start at noon sharp. Thanks! April 20: the indoor and outdoor courts are reserved by the Seattle Parks and Recreation Department until noon on April 20 for a spring egg hunt . Indoor pickleball play will start around noon that day. This is an outdoor location. Organize or join an impromptu game on one of the free public outdoor courts listed on our Courts page. Organize a game on one of the indoor courts at the Eastside Tennis Center in Kirkland, at the Bellevue Tennis Academy, or at the Pickleball Station in Kent. Consider using Playtime Scheduler to organize a new game or join an existing one.